VATICAN CITY (CNS) — Condemning deadly terrorist attacks against a Catholic and an Anglican church in Pakistan, Pope Francis said “the world is trying to hide” a wave of anti-Christian persecution in various parts of the globe. “With sadness, with much sadness, I learned of the terrorist attacks today against two churches in Lahore … provoking numerous deaths and injuries,” the pope said March 15 after reciting the Angelus with visitors gathered in St. Peter’s Square. Suicide bombers that morning detonated themselves outside the churches, which are both in the same predominantly Christian neighborhood. Officials said 15 people were killed and more than four dozen were injured by the blasts. Particularly with the persecution of Christians in Syria, Iraq and Nigeria, Pope Francis frequently has denounced the growing wave of anti-Christian violence, a violence that is not simply a matter of restricting religious freedom, but a martyrdom of Christians. 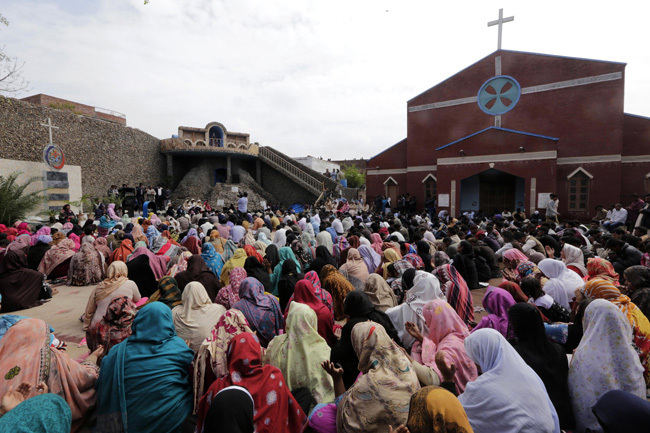 The Justice and Peace Commission of the Pakistani bishops’ conference issued a statement March 16 lamenting the “minimal” protection the government offered to Christians, despite the fact that threats against Christians had been made in the days before the attack. The police “present at the moment were busy watching a cricket match on television instead of fulfilling their task of protection the churches. Consequently, because of their negligence, many Christians lost their lives,” said the statement, which was reported by Fides, the news agency of the Congregation for the Evangelization of Peoples. Contributing to this story was Anto Akkara in India.